YOU ARE A POWERFUL, PASSIONATE WOMAN WHO KNOWS EXACTLY WHAT SHE WANTS. I’M THE HONEST-TO-GOD PSYCHIC MEDIUM, 5TH LEVEL, TRANSREIKI MASTER WHO WILL SHOW YOU HOW TO GET IT. So let’s talk about what’s possible for you. Sometimes my clients are total skeptics who get private readings, and after they scrape their chins off the floor they become lifetime believers. Sometimes my clients are spiritual giants with their heads are in the clouds, and it’s my job to bring them back to reality. No matter their backgrounds, my clients consistently achieve amazing results—because they learn how to use psychic energy to create more of what they want in their lives. My name is Shauna Angel Blue (yep, that’s my legal name), and in addition to being a 5th-Level Reiki Master and a Kundalini yoga instructor, I spent two decades developing my psychic and channeling skills. In 2000, I earned an MFA in Photography from Columbia College, Chicago. This background allows me to bring creative, psychic and healing energy to my work as an oracle and psychic medium. Words have power, and I intend to use the power of the words I speak to create a strong channel that we all can live in to evolve, succeed, sustain, love, create, enjoy and thrive for many years to come. I need to be a clear channel, drug and alcohol-free, so I am able to connect in a strong and abstract way to the messages of spirit. Nurturing our spirits is just as important as exercising our as-flesh-and-blood bodies. Everybody deserves to be loved and to live in a kind, loving, and positive relationship. My best works comes from compassion, candor, and common sense—because every single one of us wants to be happy, and we could ALL have a lot more fun getting there. IT TAKES WORK AND COMMITMENT TO LOVE YOURSELF ENOUGH TO GET WHAT YOU REALLY WANT. When you are ready and willing to make the effort, I'll show you exactly how to get YOU there. I also believe in the power of tarot readings—because they saved my life. When I was in my early 30s, I returned from a trip to Oregon. In an act of self-preservation, I’d gone off on my own to Oregon—but now I was back; isolated and turning to drugs to numb myself. Her raw sadness—on my behalf!—shifted something in my heart. To see someone else be so upset about my situation caused me to start making new choices. Just a few weeks later, I met a friend and began my journey into sobriety—and my journey into tarot. 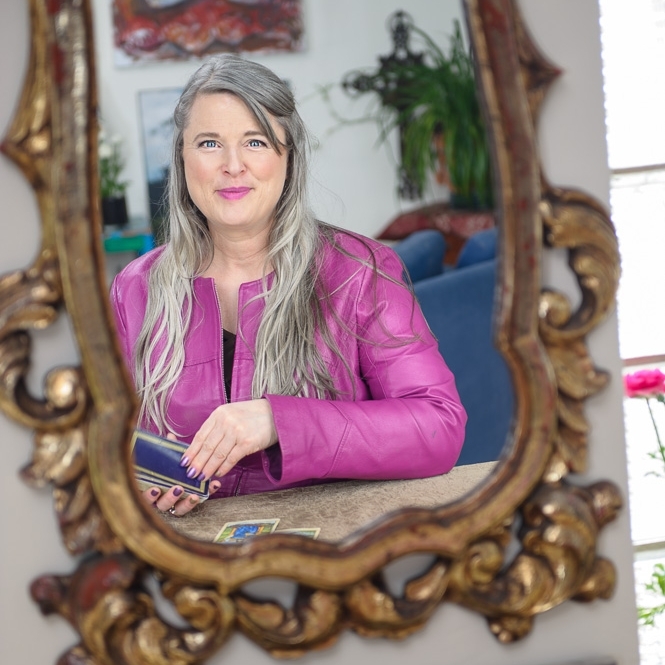 I began to study Mary-Beth’s readings; continuing to receive them on a regular basis, deepen my own understanding of tarot through charting the readings and using my own intuitions, and then using these insights to chart a path to my dream life. Since then (23+ years later), my blend of tarot and Reiki (Oh YES, I began to learn Reiki) have led me to manifest my soul mate (my husband, Willie), travel the world, and build my dream business. My life is a blessing, and its my duty and privilege to share this profound gift with you. Now my mission is to connect you to your own power and path through an alchemical mixture of tarot, Reiki, and meditative videography, what I call, "Oracle Insights".